A FARMER is set to lose 23 acres of prime arable land under plans to create six playing fields. It has been farmed for almost 115 years by four generations of the Doble family, who run Shiplake Farm, and rent the land from the Phillimore Estate. But Shiplake College submitted an application to convert the wheat field on the opposite side of the A4155 from Shiplake Farm into sports pitches. Stephen Doble, who currently runs the farm, fears the plans would open the door to gradual development “destroying” the surroundings of Shiplake. The independent school has chosen the site after its original choice of 13 acres of farmland along Memorial Avenue, also owned by Lord Phillimore, was opposed by residents who complained about the additional noise, risk to road safety and loss of open landscape. It says the new site has no immediate neighbours and would mean that pupils didn’t have to cross the busy road to reach it. 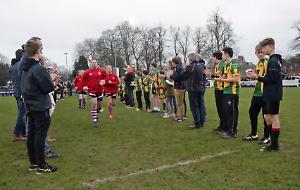 The school’s five existing rugby pitches, which are also on land owned by the estate, are in a poor condition because they are by the River Thames and unplayable for 40 per cent of the rugby season. It only leases them from September to December so they are unavailable for the spring term, when football is played, and in the summer. Mr Doble, who took over the 380-acre farm from his parents, Brian and Pat in 2011, has previously raised concerns about the detrimental effect on the landscape, wildlife and neighbours. He told the Henley Standard this week: “I farm in partnership and as tenant with several landowners around Shiplake and Henley. This means balancing the needs of my business with the environment, wildlife and the community, as my family have done for generations. Mr Doble claimed the 15 acres of arable land would be cut off from the rest of the farm, reducing the efficiency of its operations and therefore its productivity. Overall, this represented 10 per cent of the arable land at Shiplake Farm, he said. Mr Doble said he was supporting the development of additional houses in the field at the side of his farm, where 15 homes have been proposed under the village’s neighbourhood plan, despite the impact on his family’s business. He added: “However, I believe as more houses are developed open countryside becomes more important, as people have pointed out in the Shiplake neighbourhood plan. “We have co-operated with the college on a number of fronts since it opened but have resisted previous proposals on our own land for astro turf, spotlights and car parking. “Currently, the college uses riverside pitches which flood every few years. However, it takes time for the river level to rise over the winter and therefore flooding very rarely occurs during the autumn term when the college’s demand is greatest. Waterlogging is a more regular issue, but I can help resolve it with land drainage. The college says it has been searching for a site for playing fields for 50 years. In a statement accompanying its planning application it said: “Recent negotiations with the landowner of land to the west of the college have proved successful and the college now has a new proposed site that it believes is feasible and will allow for the creation of the pitches with the least possible impact to the local community. It said it was “very conscious” of the countryside and believes that the site can be returned back to agriculture in the future with “relative ease”. There will be no floodlights and the existing playing fields by the river will revert to agricultural grazing to offset the change of use of the proposed field.